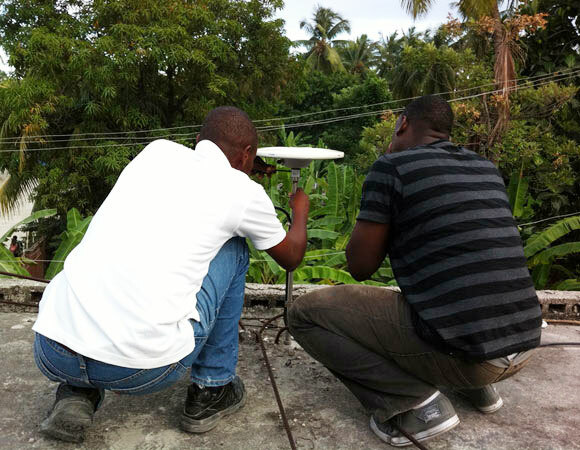 Following the earthquake of Jan 2010, 6 CGPS stations were installed in key locations around Haiti to measure the after effects and ongoing activity in the region. Of these 6 stations, only 1 was transmitting data back to UNAVCO reliably by the middle of 2011. It was determined from reconnaissance trips by local collaborators that the data transmission issues were due, for the most part, to system failures and one was actually caused by theft of the entire system. With that information in hand, a maintenance trip was deemed necessary. This trip would restore these sites to working order as the data being lost was very important to understanding the region after the major event of 2010. During this maintenance trip, all of the malfunctioning stations were brought back up and are again logging data. 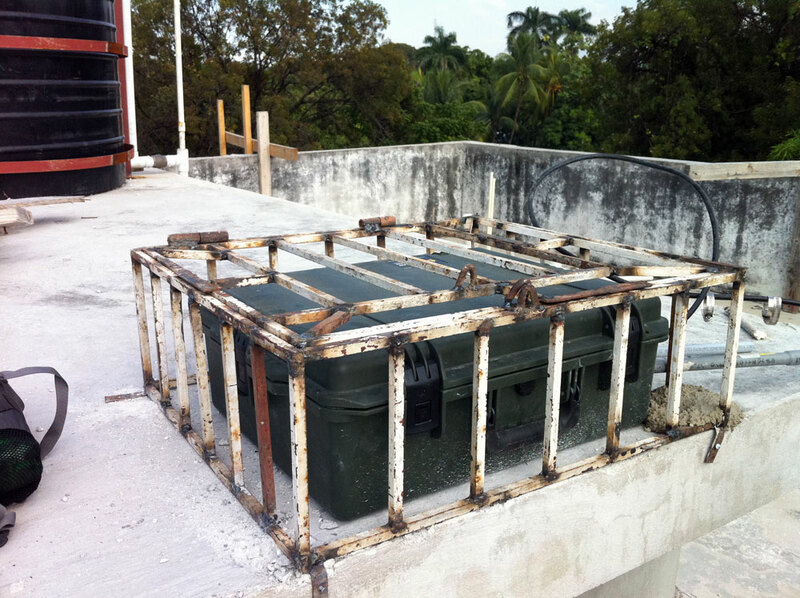 The site that was the victim of theft was also reconstructed using local ingenuity to design a more secure environment for the electronics. Figure 2. 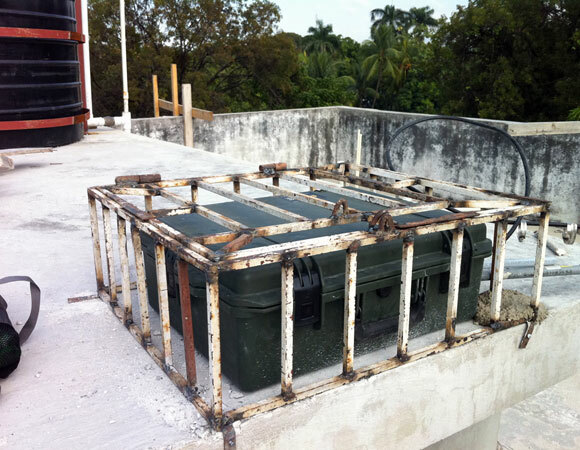 New security measures for the equipment enclosure at the reinstalled station in Leogane. Photo credit Abe Morrison. Figure 3. 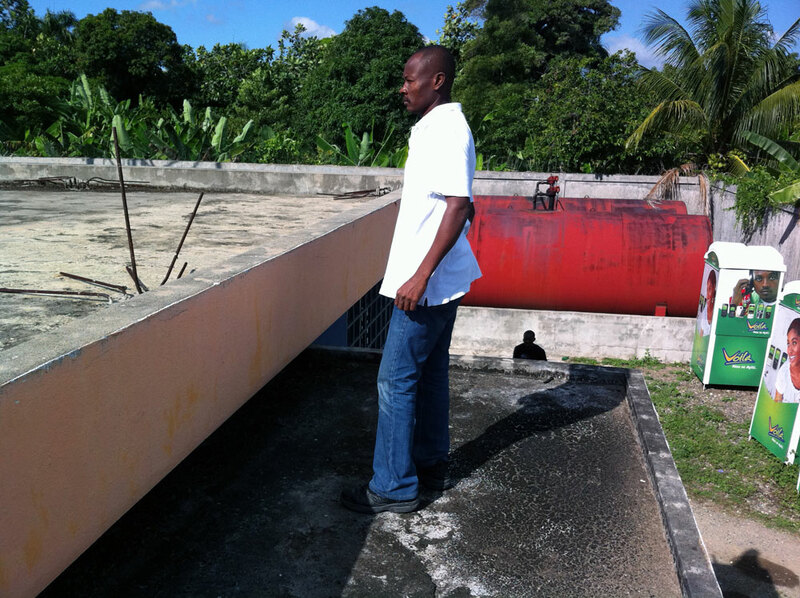 Engineer Volney, from the Haitian Bureau of Mines and Energy, assists in the site selection for the new COCONet CGPS station in Cap-Haitian. Photo credit Abe Morrison. Figure 4. 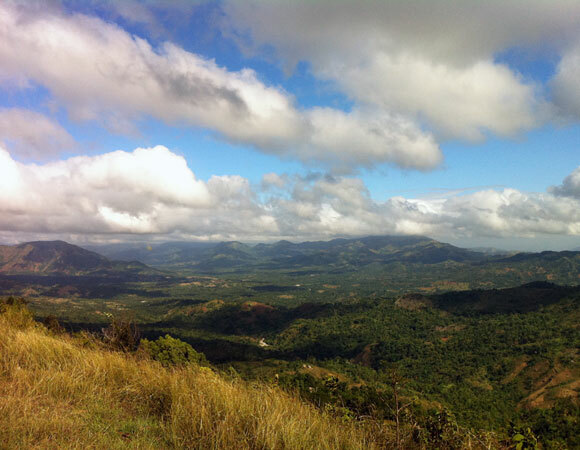 Haitian landscape looking northwest from the road between Gonaives and Cap-Haitian. Photo credit Abe Morrison. Figure 5. Traffic jam through road side market near Saint-Marc. Photo credit Abe Morrison. Figure 6. 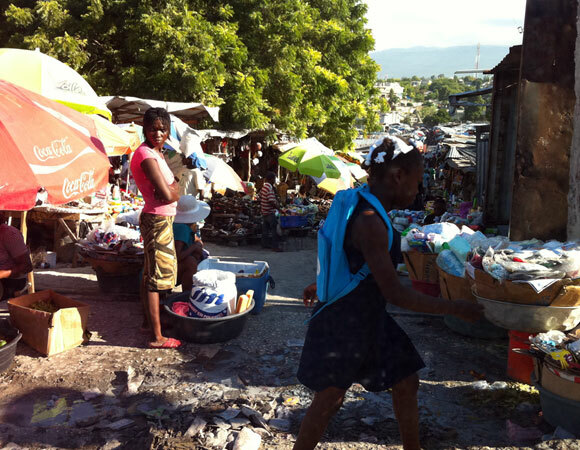 Walkthrough market in one of the tent camps in Port-au-Prince. Photo credit Abe Morrison. The 2010 Mw7 earthquake that struck the Port-au-Prince region of Haiti, killed an estimated 230,000 people, left more than 1.5 million homeless, cost 120% of the country's GDP, and destroyed most governmental, technical, and educational infrastructure throughout this region of 3 million people. 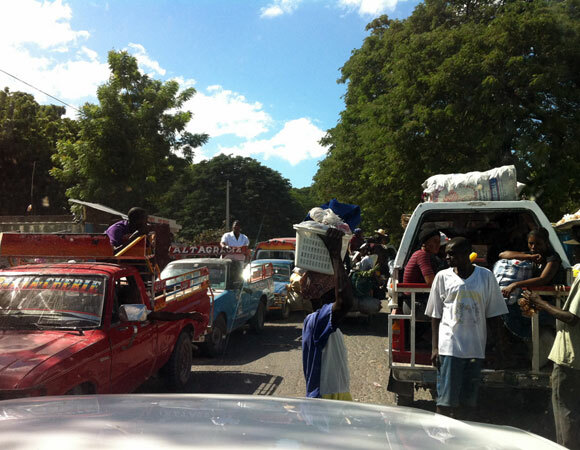 Despite warnings from the geoscience community that Haiti was at high risk for an earthquake, the country found itself unprepared. 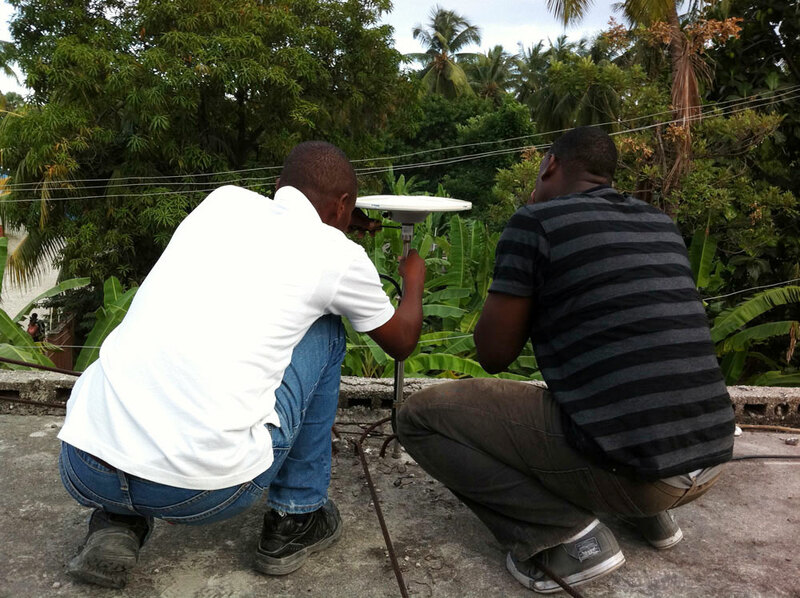 With historic seismicity indicating that this earthquake may be the beginning of a new cycle of large events, it is imperative to understand where seismic hazards are greatest in the years to come, and to prepare the people of Haiti. Along with the six now functioning stations, a CGPS station in the northern town of Cap-Haitian is also planned as part of the COCONet Project in 2012. There has also been interest from Trimble to construct another network of approximately 10 stations in the country.